She span away from me, a sleek starling becoming one with the swirling, churning mass. Something in the way she moved - her hands raised above her head to part the crowd - made me wish I had a camera to frame her, just as she was. I blinked and, in that instant, it was as if I was experiencing a flashback, although I knew it wasn’t a memory of anything I had experienced. That was the moment I became a photographer. Apparently, I bought this book in 2014. I remember nothing. It's been lingering on my kindle ever since and if I hadn't been looking for a book with a certain cover to fulfil one of the tasks for the Kill Your Darlings game, it would have been left unread for even longer. I Stopped Time really was a rare find. Having known nothing about it when I started the book, the stories of Lottie and James quickly drew me in: James is a former politician who was "disgraced" and forced to resign when a low-life paper covered his involvement with a rent boy. However, James story really begins when he learns that his estranged mother has passed away at the age of 108 and left him with forty-two boxes of, mostly, photographs. With the help of Jenny, a young art student, James begins a journey of discovering his mother's story by examining the photographs. Lottie was James mother. 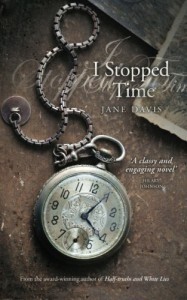 She had reasons for leaving the family when James was still a toddler, and the reason is kept from the reader until very late in the story, until we have had a chance to get to know Lottie from her early childhood in Brighton in the early 1900s, through her formative years as a famous photographer in the 1920s, and in her old age in the late 1980s. I mentioned in an earlier update that the story dragged a little in the middle. I no longer hold that criticism. It had to drag. We had to have time to learn about Lottie in so much detail. By taking us through Lottie's everyday life during and shortly after the First World War, Jane Davis makes us look at both labels and defiance. We follow Lottie as she learns who she is, and by doing so we get to see how identity is shaped (or not) by events and family.